Peter is afraid and begins to sink, but Jesus reaches out His hand and catches him..
HILE JESUS WAS alone praying on the mountain-side, the disciples were in their ship rowing toward Capernaum. And the multitude were returning homeward as they had come, walking along the northern shore of the sea. After nightfall a strong wind began to blow across the Sea, driving against the little ship. Row as hard as they might, the disciples could not make much progress against the wind. Higher and higher the waves dashed and rolled, and slower the vessel plowed through them. How tired the disciples were growing! Perhaps they were thinking about the time when a tempest swept over the Sea and Jesus had been with them, sleeping in the ship. Perhaps they were wishing for his presence now, to still this stormy wind that made their progress so wearisome and so slow. Far away on the mountain Jesus had been praying for several hours. But he had not forgotten his disciples. Perhaps he had been praying for them as well as for himself. He knew how much they needed him when the strong wind began to blow against their little ship, and he started to go to them. Out across the water he walked as easily as if it had been land, and nearer and nearer he came to the tossing ship and its weary sailors. By and by he came very near, so near that they could see him through the darkness, walking past them on the rough waves. Now the disciples were frightened; for every one had seen Jesus and they believed they had seen a spirit. They did not think he could really walk on water, for no person had ever done that. They remembered how God had parted the waters on the Red Sea for the Israelites to cross over on dry land, and how he had made a dry path across the Jordan River three times for his servant to walk upon. But never had they heard of any one walking on top of the water. This must be a spirit. And they cried out for fear of what they had seen. Jesus stopped when he heard their cry, and turned to speak to them. He said, "Do not be afraid, for it is I." How familiar that voice sounded! Still the disciples could scarcely believe it was Jesus who spoke. 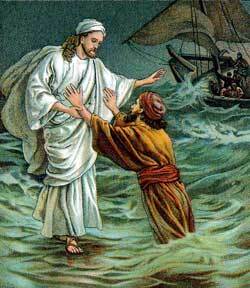 Finally Simon Peter cried out, "Lord, if it is you, bid me come to you walking on the water." With a bound Simon Peter leaped over the side of the ship and started to go to Jesus. The other disciples looked on in amazement, wondering more than ever at the great power of Jesus on both sea and land. Presently, however, they saw their fellow disciple beginning to sink in the rough waves, and they heard his voice calling frantically to Jesus to help. For Simon Peter had begun to look about at the stormy wind and waves, and just as soon as he took his eyes off Jesus he began to sink. Then Jesus reached forth his hand and caught him, saying, "O man of little faith, why did you doubt?" When the two came to the ship, the other disciples received them joyfully, and at once the wind ceased. Again the disciples marveled at the wonderful power of their master, who could perform miracles on the sea as well as on the land. And they came to him, worshiping him and saying, "Surely you are the Son of God."